The photo shows a single fronted two storey house with cast iron verandah. It was built 1868 for Howard Willoughby, editor of The Argus. 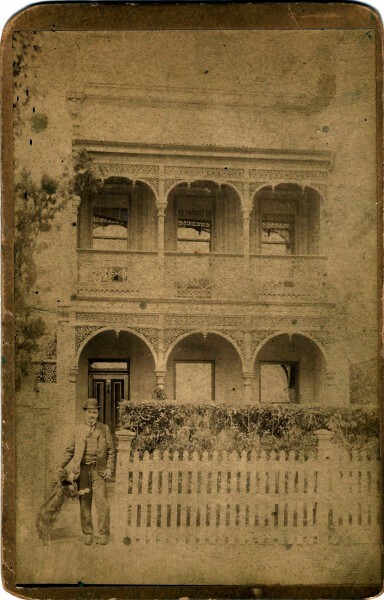 In this photo John Donaldson, donor’s great grand-father, stands at the front gate with a dog. Donaldson was a commercial traveller for Stewart and Lloyds, manufacturers of black, galvanised and steam tubes. He occupied the house 1897-1901. At this time the house was numbered 22 Jolimont Road. The house has been demolished.